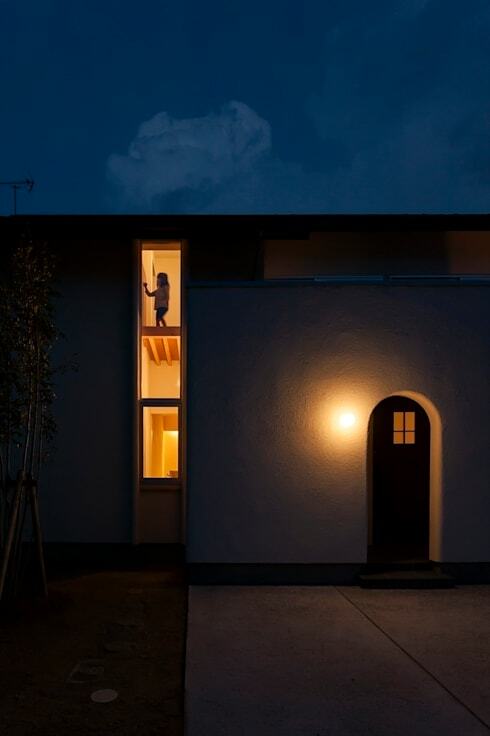 This elegant and interesting home was designed by Japanese architects, Usami. 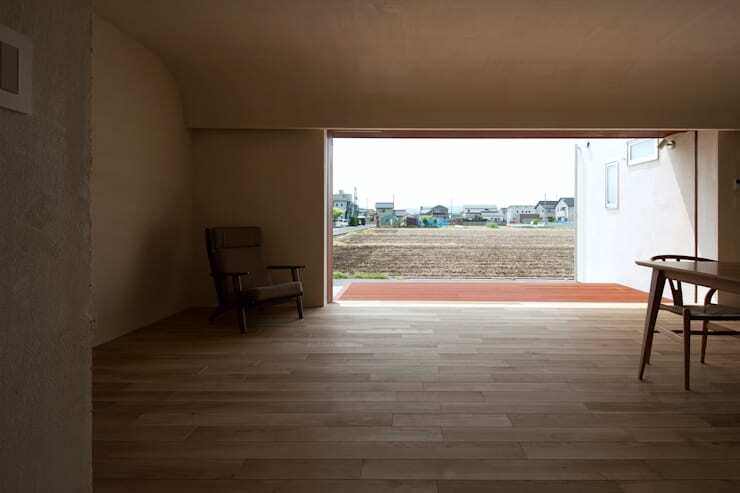 Employing traditional Japanese design principals and typologies, the architects have used a vernacular language to compose a space for modern living. 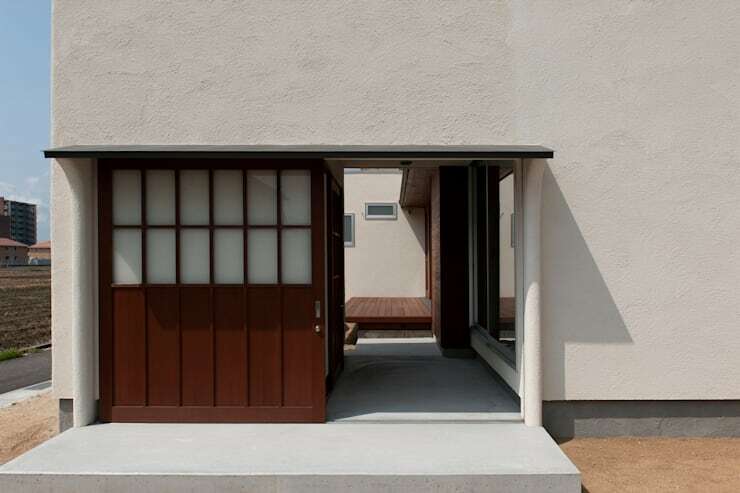 Typical of Japanese design, the home establishes a delightful play with opposites. Small nooks find residence within large open spaces, arched doors and curved ceilings counter the otherwise strict linearity, and the relationship between inside and outside oscillates—an alternation that is executed with a considered and poetic rhythm. As Lewis Mumford said, “All life rests essentially on stability and change, security and adventure, necessity and freedom; regularity and continuity, and on its reconciliation with its opposite… Balance is not established by repetition, but by rhythmic alternation”. Now let's explore the varied atmospheres of this home! The entry marks the point at which the public world and the domestic world imbricate. 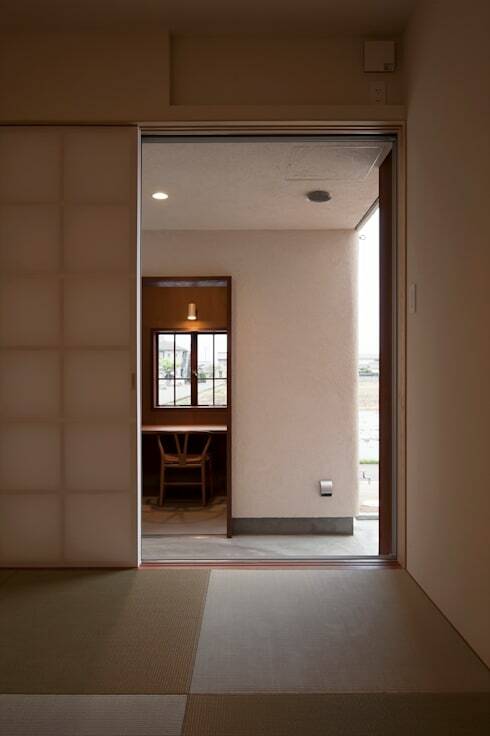 The typology of the traditional Japanese house, places value on the act of distinguishing between self and other, in-side and out-side, public and private. By establishing thresholds and gradients from public to private—the home becomes a passage from the uncertainty of the public realm to a more intimate and connected internal realm. The interior space is protected from the outside world through a series of contractions, becoming more constrictive as one proceeds further towards the centre. A secondary, and less formal, entry is offered at the side of the house. The various outdoor patios start to talk to each other, however, they remain held apart. The physical separation and difference in materials acts to preserve their difference. Instead of one undifferentiated outdoor space, a series of pockets with different qualities and functions establish a network of outdoor living. Japanese designers have a propensity to value the negative space in-between—seen as the giver of form, negative space is more that an unintentional by-product. If you would like to see some more examples of outdoor spaces, take a look at the balcony's, porches and terraces! Smallness is held in contrast to the immensity of larger volumes, of infinite space. The little office nook, located opposite this larger room, opens onto a hallway that simultaneously asserts itself as both internal and external. These transitional spaces cut into the homes interior creating a network of in-between space, mediating the contained space of the home and the expansiveness beyond. At the exterior limits of the house they bleed into the infinite external world. 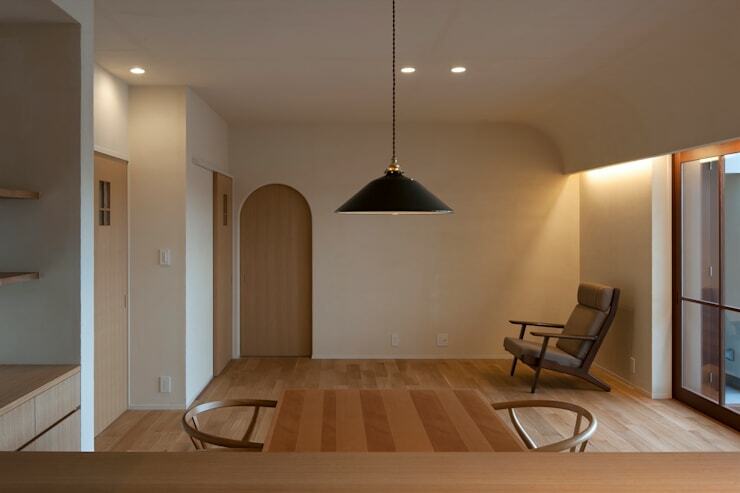 The gentle swooping curve of the ceiling emulates the arch of the door. The space feels enclosed, wrapping one in it's warm and cosy interior. The natural timbers and textured walls imbue the minimal white space with a warmth and haptic allure. The black pendant light punctuates the space and forms an anchor around which the dining space collects. Take a look at some other living spaces here! The experience and atmosphere of this living space—that was once embracing, securely distanced from the outside—is completely inverted. The sliding doors slot into the wall cavity and the space is opened, seamlessly, to the exterior. The inhabitants can alter the relationship between inside and out, public and private, to correspond to both the rhythms of nature and the rhythms of their daily activity.